Martine has been a volunteer with Meals on Wheels since 2009. She became a volunteer because she was attracted by Meals on Wheels’ tagline of being “more than just a meal”. She appreciates that le Centre d’acceuil Champlain, one of our partner kitchens, is quite close to where she lives. Martine wanted to help and get involved in her community as well as improve her knowledge of food safety. For Martine, food safety involves precautions taken while handling food, such as maintaining food at proper temperatures, proper food preparation and adequate time to transport the meals from the kitchen to the client. Martine is acutely aware of the importance of food safety in relation to senior’s health. In her spare time, Martine plays the flute. She has been playing for 7 years and has played with different nonprofessional groups (from groups of 2 to 70!). As well, she sings in a chorus at the Notre-Dame-de-Lourde Church. She also enjoys knitting and crocheting dishcloths and baby blankets. She credits her volunteer experience with developing her communication and time management skills. Since she doesn’t have a driver’s license, Martine is quite happy being teamed up with a volunteer driver during delivery. Similarly, she appreciates being able to call staff members at Meals on Wheels when she is worried about a client. Martine also volunteers in the community at the Day Centre for le Centre d’acceuil Champlain where she accompanies seniors to activities (such as music classes), and to appointments outside the building. Volunteering allows Martine to reach her personal goals, by adding experience to her resumé and further developing her social skills. 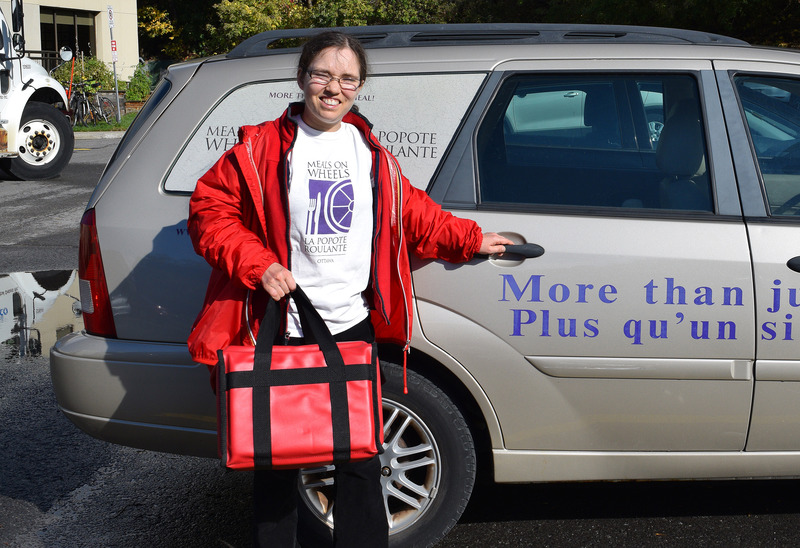 Meals on Wheels has had a significant impact on Martine’s life, as she feels useful and valued helping clients. For her, knocking on the door is a welcome challenge because you never know what might be affecting the clients from day to day. She strongly recommends volunteering as individuals can choose meal pick up locations that are the most convenient for them. It’s also a great experience to add on a resume and Martine finds that it’s a rewarding activity for the volunteer and others in the community. When she thinks about Meals on Wheels, three concepts come to mind: smiling, a sense of community and a common purpose. As a longtime volunteer, Martine appreciates the multiple smiles she gets, the ability to connect with people (who sometimes ask about her) and the recognition from the families, whether they are francophones or anglophones. She wants to congratulate Meals on Wheels for the useful service rendered to the community and hopes it will remain available for a long time.